I'm sadly still without internet (though my laptop has been repaired at last), so posts around here may be a little thin on the ground for a while. I did, however, want to devote some time to talking about Big Beach Bums, which happened over a week ago now. Of course, I was useless and didn't really take any photographs, so instead I've pinched a few from the lovely Claire and Ragini, who both posted about the day also. 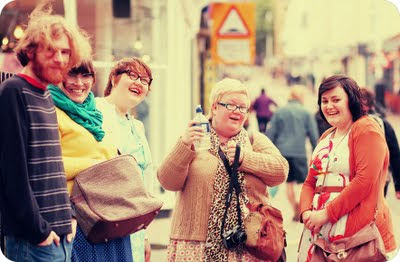 My boyfriend (who lasted all of about half an hour on the vintage front, haha), Rebecca, me, Claire and Nadia after first meeting up. After this we headed off and ate some cheap grub at Pompoko, and then hit the bargain rails on Sydney Street (where I scored a lovely plaid 40s-esque dress, and Ragini found a lovely coral trench for £5! 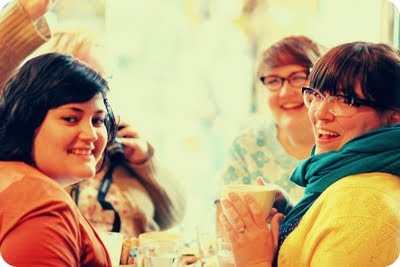 ), before hitting a coffee shop for some well deserved rest and chattering. After this we headed to meet up with our other halves in the pub for some more drinks. Overall it was a lovely day, and great to get to hang out with everyone for so long! I only wish I could spend more time with such awesome fats on a more regular basis. Outfit post to follow shortly!